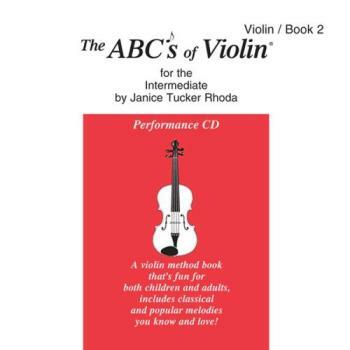 By Janice Tucker Rhoda () - This beautifully recorded CD for violin solo and piano accompaniment includes all of the pieces in Janice Tucker Rhoda's ABCs of Violin for the Intermediate Player ¦ Book 2 (ABC3),from the best-selling ABCs of Strings series. It is to be used in conjunction with this book and The ABCs of Violin Intermediate DVD (DVD22) and will facilitate homepractice, allowing students of all ages to prepare for recitals and have fun playing along with the music! For intermediate players.